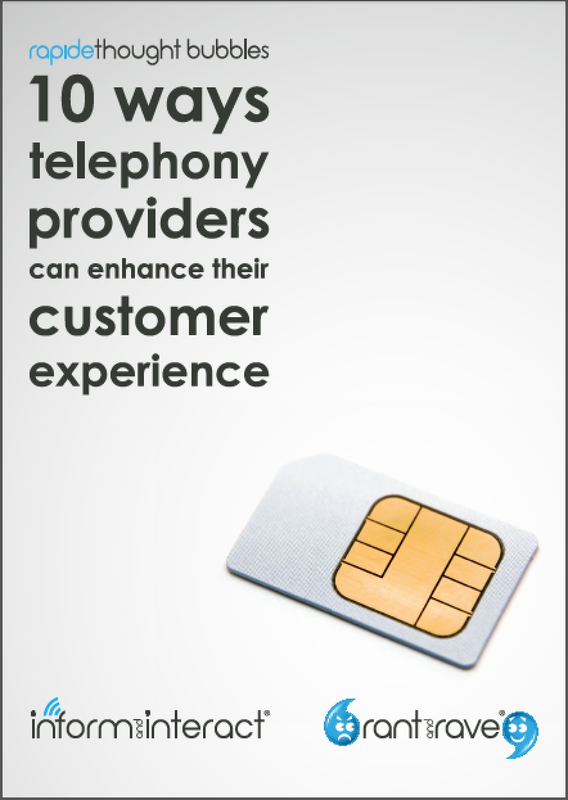 Aimed at telephony providers, this White Paper came up with 10 ideas for leveraging their products and services out of Normal profits into value-add supranorms. It’s again with Rapide, the Moments of Truth company. Here’s the paper (6.1Mb PDF). The core competencies of telephony providers – voice and data, messaging and minutes – are fast becoming commodities. With the bars of SLA and QoS consistently high, how can sector players differentiate their services? Technology company Rapide believes the answer lies in enhancing the customer experience – with cases from customers using its proactive communication solution, Inform & Interact and real-time feedback solution, Rant & Rave, as examples. From connecting with celebrities in consumer mobile, to transcribing spoken comments for an integrated provider of business telephony, this paper presents ten ideas for making the most of a resource telephony providers have in abundance – the ability to talk and listen.